Finding the perfect baby crib mattress can be a bit of a challenge and requires thorough research and thoughtful considerations such as whether or not to go for an organic crib mattress, memory foam, innerspring and the likes. Since your babies will be spending much of their time on a mattress, why not get what’s best, non-toxic and harmless for them? This review is written to help you make great decisions and go for what’s best when it comes to buying the right kind of crib mattress for your kids. Let’s start by listing the top 5, we will later go on to explain why we chose each one. Now that we have listed the top 5 crib beds, let’s go on to discuss why we chose each one, we will explain each product in some detail and highlight their pros and cons. 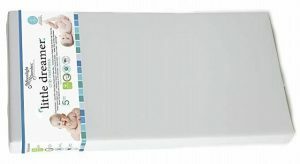 This dual firmness (for infants and toddlers), hypoallergenic crib mattress has a waterproof, durable stretch knit fabric with extra tight sewn seams cover and is toxic-free, Eco-friendly and CertiPUR Certified. It makes it easy to switch from the extra firm plant-based foam side for your Infants to the plush foam side for your toddlers. The foam is vinyl, polyethylene, PVC and phthalates free as well as toxic, flame retardant chemicals free with safely sewn seams to rid bed bugs and dust mite, making it extra safe for your baby. The cover of the mattress is water resistant and hypoallergenic, making it easy to wipe off stains and dirt with a wet cloth. When you think healthy, earth-friendly crib mattress, Sealy Soybean should come to mind. This mattress is made from natural and renewable soybean grown in America and CertiPur-US Certified foam with no phthalates, lead, mercury, formaldehyde, PBDEs, TDCPP or TCEP flame-retardant chemical, making it healthy and safe for your little ones. The lightweight firm mattress is made with waterproof and stain resistant cover which makes it easy to wash and carry around. It isn’t completely made with soybeans, rather a mixture of 78% polyurethane foam and 22% of other materials, including soybean. 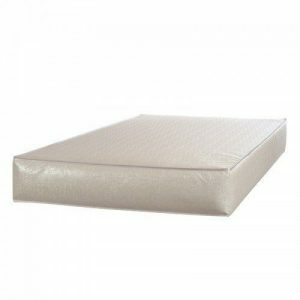 This crib mattress is made of 100% organic materials (both the interior and the exterior) with absolutely no chemical flame retardant, no latex, soy, GMOs, vinyl/PVC, phthalates, formaldehyde, flame retardants, or perfluorinated compounds (PFCs). The mattress has layers of organic cotton batting which create a perfect blend of comfort and firmness and also made with non-toxic and stain resistant waterproof surface, a safe alternative to vinyl/PVC with a bed bug/dust mite barrier. The non-toxic mattress meets the Greenguard and GOTS certifications and is completely safe and it has a lifetime warranty. This comfortable crib mattress is made from polyester fibers, which provides firm support for the mattress. It is a budget-friendly mattress with a vinyl covering, making it resistant to stains and smells. The mattress is a high-density thermo-bonded core, free of phthalates and hypoallergenic. The lightweight mattress has a waterproof cover and has a zip for easy removal and washing. 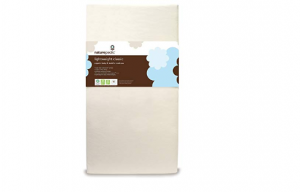 This dual-sided mattress with one side being firmer than the other to suit your toddler when they outgrow their crib is CertiPUR US certified and made with certified organic cotton cover. It is a lightweight eco-friendly mattress made with (non-food) plant oils which replace petroleum-based oils, making it safe. It has a waterproof covering and is easy to wash. Some people claim that the quality of the waterproof cover is a little inferior. Each of these mattresses has its own unique features. However, certain qualifications are required in opting for the best kind of crib mattress for your baby. Here are things to look at for when purchasing a crib mattress. Nothing feels as terrible as sleeping on a really bad mattress when you hope to enjoy a very relaxed and comfortable sleep, especially for toddlers, who will be spending more of their time sleeping in one. So, it is absolutely important for your toddlers to get maximum comfort in their crib mattress. A majority of the SIDS (Sudden Infant Death Syndrome) cases is as a result of suffocation, which is either due to overheating or getting one’s face stuck down. Getting the right kind of crib mattress with ideal support is therefore instrumental for your baby’s development. If the mattress isn’t firm enough or too soft, a baby can roll over onto his stomach and sink into the mattress, making it a little difficult to adjust their position or roll back over. We all know that sooner than later, the mattress is going to get all sorts of designs and paintings from poop and pee, which might eventually ruin the mattress in no time if the mattress isn’t washable. Going for mattresses with removable covers or waterproof mattress are some of the best options to consider. Breathable mattresses are made with materials that can allow a baby breathe freely even if his/her face is pressed down on the mattress or when the temperature of the room gets a bit hot for them. This factor is important to reduce the risk of SIDS. Did you know that a typical baby can sleep for 16-17 hours a day? Apparently, a baby spends a good number of hours in a crib. So, a good crib mattress definitely plays a vital role in the comfort and well being of your little angel like making a good bedtime for them, supporting their bodies as they grow. Hence, it is extremely important to make the right choice when getting a crib mattress. According to the National Institute of Child Health & Human Development, using the right firmness of mattress (preferably a hard mattress, rather than a soft one) for your baby is essential in reducing the risk of SIDS and other related causes of infant death. A breathable mattress is a mattress with an air permeable sleep surface to ensure a baby sleeps comfortably and safely. A good breathable mattress works in a way that allows continuous air flow because the upper sleeping surface is perforated. This way, even when your baby rolls over in a facedown position while sleeping, especially if sustained for so long, chances and risks of suffocation are minimal because of the design of the mattress. It’s no news that most traditional mattresses often cause our bodies to overheat, making us sweat and feel very uncomfortable. A good crib mattress should allow easy flow of air to ensure that no heat is trapped between the body of the baby and the surface of the mattress. This will definitely make your baby comfortable, whether during the winter or summer. Usually, gems and mold are often trapped in moisture. Getting a good crib mattress which complies with both factors above will definitely make a poor hideout for gems because the perforation in the surface of the mattress means there won’t be any accumulation of moisture in it. 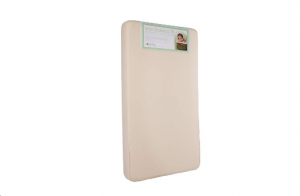 Crib mattresses come in 2 types– foam mattresses and innerspring mattresses. Foam mattresses are less expensive and they come in a different range of thickness and density. However, the denser the mattress, the better. So, make sure you test the mattress before buying it by pressing your hand into the middle of the mattress to see if it forms an indent that fades away quickly. If it does, then it’s a good mattress. Innerspring mattresses, on the other hand, are more expensive but often more durable and the more the coils of the spring, the firmer the mattress. Also, the gauge of the wires used in innerspring mattresses plays a vital role in determining the firmness of the mattress. The lower gauge, the firmer mattress. So, look for a mattress with 135 or more coils and a gauge lower than 15.5. The weight of the mattress. Lightweight mattresses are easy to carry, change the sheet and air-dry every now and then. Waterproof capacity- A waterproof mattress has significant longevity and lifespan to a non-waterproof one. Durability- A mattress made from a strong material like nylon will last longer, maintaining its integrity over a long period of time than one made with a thin cover like vinyl. First, it is important to know that to enjoy a long-lasting mattress, you will need to be proactive for proper maintenance. First, check for a care label to know how best to clean the mattress (whether to use cold/warm water and gentle detergent in washing the mattress). Clean up spills immediately after they happen. Do not let them sit or soak into the bed. Vacuum the mattress as often as possible to get rid of dust and dirt. Be sure to vacuum the sides and bottom of the mattress as well. Air dry the mattress in the sun occasionally to rid it of moisture and dampness. That way you can avoid the build-up of bacteria and mold. Considering re-using the crib mattress for your second baby? Yes! Then, how should you store the mattress? For better storage, keep in a dry, temperature regulated environment, perhaps in a plastic wrap or in the original box. Do not keep the mattress in a place where it will have any contact with moisture in order to prevent the build-up of gems. Avoid direct heat and sunlight to prevent degradation of the materials. First, check that the crib meets the Consumer Product Safety Commission (CPSC) and the Juvenile Products Manufacturers Association (JPMA). Make sure the mattress fits properly into the crib. Make sure the slats of the crib are wide enough to allow a can of a soda to pass through successfully. This way, your baby’s hand or feet won’t get stuck. Do not hang anything on or above your baby’s crib to avoid sudden fall-out. Do not place the crib near the windows, blinds or any wall decoration hanging on a string or cord. Always lay your baby on his/her back to reduce the risk of Sudden Infant Death Syndrome (SIDS). Avoid using a blanket. Instead, opt for a sleeper. If you are using a blanket, place your baby’s feet to the foot of the crib and tuck a thin/light blanket around the crib mattress, covering your baby only as high as his/her chest. Avoid using just any sheets. Opt for only fitted sheet made specifically made for crib use. Have you used a different crib mattress that you think should be on this list? Please let us know by leaving your thoughts and sharing your experience(s) in the comment show.